In two weeks RUST Festival will take over Santa Anita Park, transforming it into a stomping ground for collective hard rock and heavy metal fans. Paying homage to to the legendary “Heavy Metal Day” at US Festival ’83, attendees will have the rare opportunity to experience back-to-back live performances of some the most influential songs of the genre, all in one place, on one glorious day: November 25th, which has been deemed Black Saturday, the new annual Hard Rock Holiday. 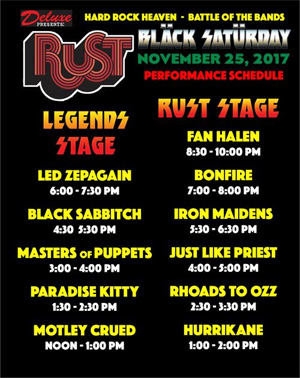 RUST Festival will feature a high-powered lineup of “A-List” artists from the SoCal hard rock tribute scene with eleven live performance tributes to VAN HALEN, LED ZEPPELIN, BLACK SABBATH, AC/DC, OZZY OSBOURNE, SCORPIONS, IRON MAIDEN, JUDAS PRIEST, METALLICA, MOTLEY CRUE, and GUNS N' ROSES. A limited amount of discounted tickets are still available for RUST Festival. During this promotion, ticketing packages are available at the following discounted rates. “Festival Pass” includes one general admission ticket. Adult (18+) are $47.99, Youth (13-17) are $23.99, and kids 12 and under get in free. “Backstage Pass” includes a “Festival Pass,” Backstage Lounge Access, Side-Stage Bleacher Seating, RUST Event Poster, and Laminate Pass. Adult (18+) are $95.99, Youth (13-17) are $47.99, and kids 12 and under are $23.95. Visit http://rustfestival.com/early-bird for more information and to purchase tickets. All kids 12 and under must be accompanied by a parent or legal guardian.RUST Festival is produced by DELUXE Presents. The RUST FESTIVAL was created in 2005 as a tribute to the legendary US Festival’s “Heavy Metal Day” on May 29, 1983, which featured the most iconic acts of the hard rock/heavy metal genre of its day. Produced by STEVE WOZNIAK of Apple Computer fame, US Festival ‘83’s “Heavy Metal Day” remains widely acknowledged as one of the greatest rock concerts of all-time. DELUXE Presents was formed in 2016 to produce boutique music festivals.